The issue of household recycling is one that continues to gain media coverage, and is something that homeowners across the country are asked to consider almost constantly while carrying out their daily chores around the house. The problem is, many families and individuals are still failing to recycle large volumes of items, which is placing considerable pressure on already stretched landfill sites. But who’s responsibility is recycling? Well, the answer is simple – it’s everyone’s. 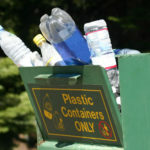 Data published in 2016 by Recycle Now revealed that British Households are failing to recycle as many as 16 million plastic bottles every day, amounting to nearly half of the total of more than 35 million that are used and discarded daily. The campaign group suggested that the number of bottles going to landfill could reach 29 billion by 2020, as widespread consumer ignorance and unjustified fears about contamination when recycling bottles for household cleaners meant that households fail to recycle correctly. Commonly used items that people do not realise should be recycled include empty bleach, shampoo and conditioner packaging, along with bathroom and kitchen cleaners, and soap dispenser bottles. Only bottles containing chemicals such as anti-freeze should not be recycled. However, in short, there is simply no excuse for failure to recycle plastic bottles, cans, glass and paper. Local councils have for years provided a near universal recycling solution. Unfortunately, both local authorities and MPs have been reluctant to highlight the actual scale of household waste, concentrating predominantly on commercial food waste. According to Eurobarometer, household food waste in the EU is 53% of total food waste, compared with the widely publicised 5% food waste from retailers and 12% from food service dining. One of the issues surrounding household food waste is that many people wrongly believe items have “gone off” when they are still perfectly fine for consumption. For instance, according to Wrap, UK houses throw away 1.4 million edible bananas each year. Many of these could have been eaten or used in cooking. If nothing else, households need to consider, in these times of low wage increases, that the amount of food wasted per household runs into hundreds of pounds per year. Few of us can afford this level of waste. In Norway the system for recycling empty bottles and cans is called Panteordning; where a charge is added to the bottle or can at the point of manufacture in one of two bands. Containers that store below 500cc carry a charge of 1 krone (about 9p) and containers above 500cc carry a charge of 3 kroner. The empty containers are taken by the consumer to what is essentially a reverse vending machine sited in food stores and supermarkets. The machines take in the containers and either shred or compact them before rewarding the consumer with a refund of the charge by a voucher and possibly store promotion vouchers. The charge that is added to the containers is retained in the scheme if the container is not recycled, helping to fund the scheme, which has been managed by a company called Norsk Reskirk since 1999. To enable the reverse vending machines to correctly identify the bottles and cans additional labelling is required on the packaging to allow the machines to correctly identify the type of plastic or metal it was accepting. This labelling is usually printed with the refund amount too. In the UK we recycle only 45% of the containers we use, only 16 million out of 36 million per day. In Norway this figure is around 94% for plastic bottles and 81% for cans. The majority of carbonated soft drinks bottles in the UK are made from PET plastic which is an easily recycled and valuable form of plastic. Bottles and cans which are recycled can be reformed into new packaging and then recycled all over again, this saves on both raw material imports and energy costs. The fact that the bottles and cans would carry a refundable charge would encourage recycling among consumers by providing an incentive for doing so. Such a charge would have to be high enough to ensure the interest of consumers in recycling the products. In a similar way to the Norwegian model a charge of 10p per container below 500cc and a charge of 25p for larger containers should encourage consumers. As the Norwegians have shown, this system does work. It is also used in the USA in some of the more environmentally friendly states. The UK’s current doorstep recycling collection scheme is clearly not doing enough to encourage consumers to recycle and a new approach is required. It is common knowledge that plastic pollution in the oceans and the countryside in a major problem, this charging system will not cure all of the problem but is a valuable first step along the way, we cannot continue to talk about this problem we must act now. It is time for the UK government to step up to the mark and create enforceable legislation to impose this type of system in England and Wales. WF Denny is a national supplier and distributor of eco-friendly and biodegradable food packaging, as well as standard packaging and catering disposables, with over 90 years’ experience in manufacturing these items. WF Denny also stocks a wide range of partyware for consumers and is passionate about delivering a great service to businesses and the public alike.